COLORADOSPRINGS, Colo. - A top NASA official said U.S President Barack Obama willannounce plans to continue development of a stripped-down version of the OrionCrew Exploration Vehicle for use as a crew lifeboat on the International SpaceStation. Obama, whois scheduled to delivera space policy speech at NASA's Kennedy Space Station in Florida April 15,will also unveil plans to initiate development of a heavy-lift launch vehicleby 2015, NASA Deputy Administrator Lori Garver told reporters following remarksat the 26th National Space Symposium here April 13. Orion ? partof NASA?s five-year-old Constellation program designed to replace the retiring spaceshuttle with new rockets and spacecraft optimized for the moon ? wastargeted for termination in Obama?s 2011 budget request. Since then lawmakersfrom both parties have sharply criticized Obama?s proposal to scrapConstellation in favor of investing in privately developed crew taxis capableof ferrying astronauts in low Earth orbit. Garver said NASA?sOrion contract with Denver-based Lockheed Martin Space Systems would berestructured to develop a variant of the space capsule that could be launchedunmanned to station within the next couple of years to serve as a crewlifeboat. 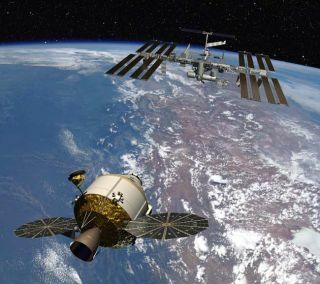 Garver said the plan would allow the agency to retain some of itsmultibillion-dollar investment in the program while reducing U.S. reliance onRussian Soyuz spacecraft currently used as an emergency crew escape capabilityon the space station. ?It allowsyou to keep the ability to go beyond low Earth orbit with humans,? Garver said,adding ?the investment we made in Constellation along those lines is somethingthat will benefit our program as well as allows us to rely on the Russians fora shorter period of time.? Garver saidNASA has no plans to continue development of Orion for explorationbeyond low Earth orbit. "Wewill ask them to focus Orion for the government purposes on our uniquerequirement of crew escape," she said, adding that Lockheed Martinwould be welcome to use the Orion capsule to bid on the agency's $6 billioncommercial crew program proposed in the president's 2011 budget. "Thatwould be a company decision on bidding for commercial crew technology,"she said. Garver saidObama also would announce a plan select a heavy-lift vehicle design by 2015, anelement previously missing from the human spaceflight plan put forward inObama's 2011 budget. That omission has drawn fire from lawmakers concerned thata heavy-lift development program is needed to maintain the nation?s leadershipin mannedspace exploration. ?We?re going to have a date specific to make a decision about the heavy liftvehicle in 2015,? she said, adding that the $3.1 billion Obama proposed tostudy advanced heavy lift propulsion capabilities over the next five years ?isgoing to have us much further along down the path, and when we choose thatvehicle we?ll be able to have a running start.? Meanwhile,NASA will have five years to flesh out concepts for other technologies thatcould be developed to support human space exploration beyond low Earth orbit,including on-orbitpropellant depots, inflatable habitats, and in space resource production. ?Things thatallow you to size your architecture in a way that we?ll be able to go beyond[low Earth orbit] farther, faster, with a heavy lift that truly makes sense forthe program,? she said. ?And using more of the advanced technology that we?veinvested in the heavy lift program. ?